Medical Statistics provides the necessary statistical tools to enable researchers to undertake and understand evidence-based clinical research. It is a practical guide to conducting statistical research and interpreting statistics in the context of how the participants were recruited, how the study was designed, what types of variables were used, what effect size was found, and what the P values mean. It guides researchers through the process of selecting the correct statistics and show how to best report results for presentation and publication. 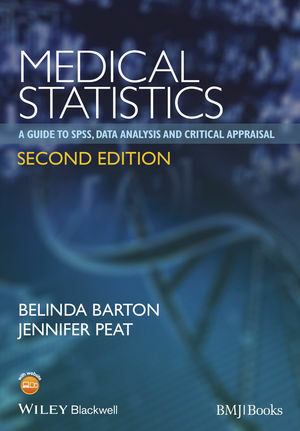 Clear and concise explanations, combined with plenty of examples and tabulated explanations are based on the authors’ popular medical statistics courses. The table of contents is divided into sections according to whether data are continuous or categorical in nature as this distinction is fundamental to selecting the correct statistics. Each chapter provides a clear step-by-step guide to each statistical test with practical instructions on how to generate and interpret the numbers, and present the results as scientific tables or graphs. The chapters conclude with critical appraisal guidelines to help researchers review the reporting of results from each type of statistical test. This new edition includes a new chapter on repeated measures and mixed models and a helpful glossary of terms provides an easy reference that applies to all chapters. Belinda Barton, Head and Psychologist, Children's Hospital Education Research Institute (CHERI), Conjoint Senior Lecturer, Sydney Medical School, University of Sydney, NSW Australia. Jennifer Peat, Associate Professor, Department of Paediatrics and Child Health and Senior Hospital Statistician, Clinical Epidemiology Unit, Children's Hospital, Westmead, NSW Australia. Original data sets for SPSS are available for download and practice.